If you think you have subterranean termites, then you need to be positively certain. 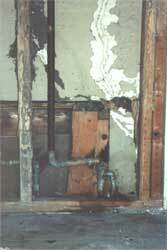 Most of the time you will not see termites crawling around. Unlike ants, subterranean termites travel in mud shelter tubes. These mud shelter tubes protect and hide the worker and soldier termites from view. Subterranean termite swarmers appear in the United States starting in February (south Florida) and swarm until early June for the northern areas of the United States. 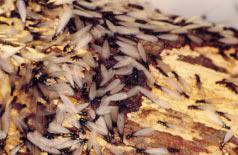 In most instances of swarming, the individual termite colony only swarms 1 or 2 times. It is not a constant swarming cycle and unless you are lucky enough to witness the swarm or find dead swarmers or wings, you may miss it. 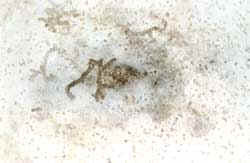 In coastal areas of the US, drywood termites are common. 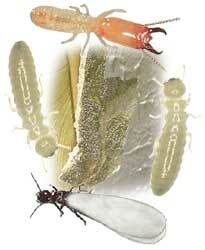 Drywood termite swarmers differ from subterranean termites in appearance primarily in color. Drywood termite swarmers are red with blackish wings - and can be confused with carpenter ants. 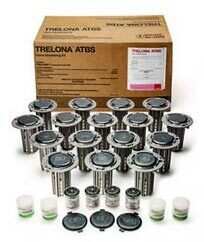 For more information on subterranean termite identification, click here. 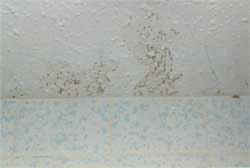 For more information on drywood termites, click here. Subterranean termites build mud shelter tubes in which they travel. These mud shelter tubes are connected with the termite colony and are constructed of dirt and an acid substance contained in their saliva that the worker termites secrete. The mud shelter tube helps to protect the worker termites from predators such as ants, and also provides them with humidity. Most importantly, mud shelter tubes give the blind worker and soldier termites a highway in which to travel to and from their food sources. Mud shelter tubes are very hard packed, and usually as they get older, they get harder and larger. Some mud shelter tubes are as small as a pen others can be several inches wide. You may findsubterranean termite swarmers, soldiers and workers. You will not find queens or kings because they are hidden deep inside their colony. 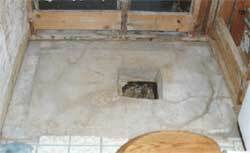 Subterreanean termite mud shelter tubes are usually found on the outer sides of foundation walls as seen in the photo above. 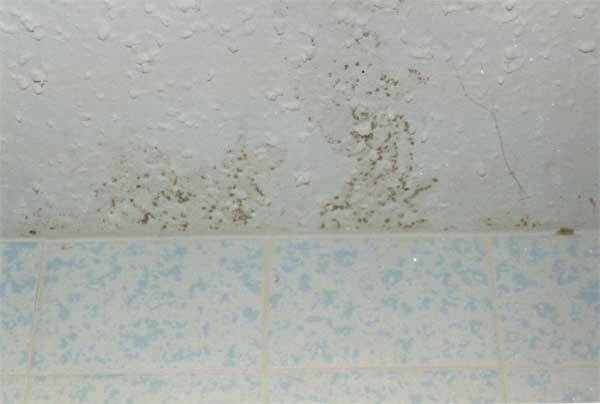 They can also be seen emerging from sheetrock in ceilings, and on sheetrock walls as shown in the pictures below. 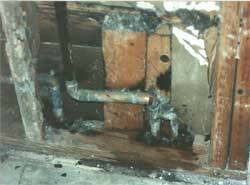 If you are find signs of termite damage or termite mud shelter tubes, subterranean termites have infested your home. The time to treat is NOW. There is no best time to treat for them. 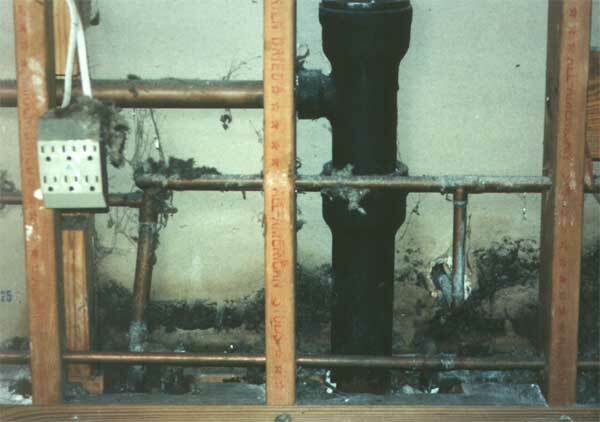 Summer, winter, spring or fall, subterranean termites can be active all year round in a heated building. 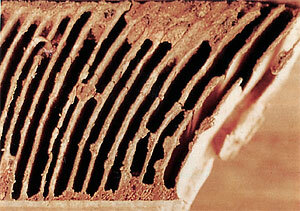 Subterranean termites will not just disappear or go away. If they have infested your home or business, the only thing that will stop them is a proper treatment. If you do nothing, the termites will continue to eat and cause damage. 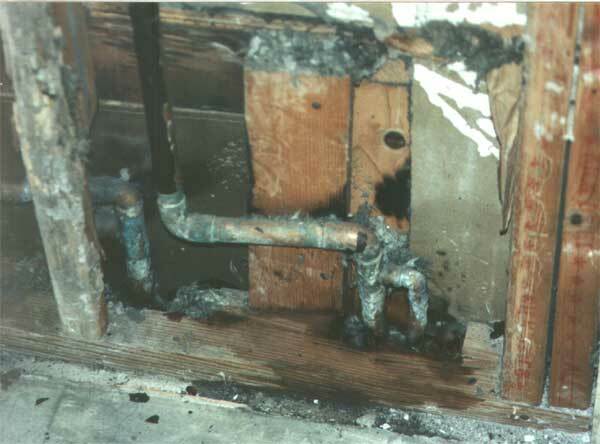 At some point, structural damages could occur. If you are battling formosan subterranean termites, (gulf coast areas), your entire home could be destroyed in as little as a year and a half. Subterranean termites should be taken very seriously. Fortunately, they are usually easy to control. All you need is the right approach and the right materials. We call this the "Termite Battle Plan". 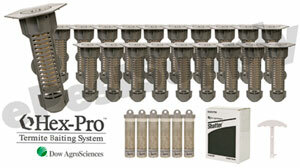 Let us help you develop a "Termite Battle Plan" to rid your home of subterranean termites with Hex Pro Termite Baiting System and the Solo Wall Foamer.